Intro to Wordpress: Why Use Wordpress for Your Business? Intro to WordPress: Why Use it for Your Business? In the digital world, a website is crucial to a successful business. Starting a blog or website can be time-consuming, however – making it important to find software that is easy to learn and use. There are many tools on the market that provide similar results, but WordPress stands out above the rest because it has more features and is fully customizable. It is a great web management platform, and its software and hosting is completely free. WordPress was originally released in 2003 as a blogging tool, but has – through updates and upgrades – become so much more. It is capable of providing more varied product than the leading competition. Other blogging platforms are only capable of providing more basic features, with a few exceptions. WordPress manages around 20% of new websites that you see and interact with on a daily basis. As was mentioned, WordPress started as a blogging system but has since evolved into much more. It can be a full content management system, or a set or static informational page. It can also do both, and be a blog where updates and posts are made about the company, et cetera. Here are some of the key features that make WordPress stand out above other similar platforms. Included are also short descriptions of the features. After learning what WordPress is capable of, users can begin to think of ways to adapt them to meet their own business goals and needs. Pages are static entries on a website that do not work like a regular blog. A blog is updated with new posts regularly, but a page is written once and published in its own place. This feature allows WordPress users to create content such as company information or create whole websites that do not have any blog in them. This is an important tool, but is common in most blogging platforms. WordPress does not stand out for this feature. 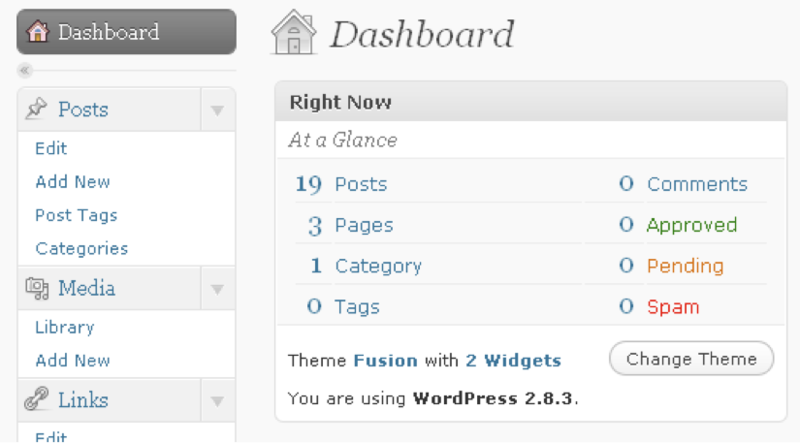 By far the most useful part of WordPress is the plugins. This is where it stands out above other content management systems. Plugins can change a website drastically or modify it to meet specific needs of many different users. There are plugins for just about everything. Of note for marketing is a plugin that will for example automatically publish posts to a Facebook wall when a new article has been posted on WordPress. Another great plugin allows users to comment after logging into their favorite social network site. This allows them to link it to their friends and show them what they commented on. There are thousands of different plugins on the WordPress database. The layout of WordPress is completely customizable. There are many pre-made themes that will work for many situations, but with the right knowledge of CSS, users can develop their own themes – personalizing their site that much more. Even if a premade theme is used, other portions of the site, such as sidebars, are customizable with little previous knowledge of web editing. Spam protection is important for blogs and websites. Many other websites try and advertise their own sites by posting comments in other people’s blogs with “link-backs” that generate traffic to their own websites. Blog authors can moderate all posts to make sure that everything is pertinent to the site. WordPress allows a website to have multiple authors with varying amounts of permissions on the site. For example, a “writer” can have only permission to post a draft, while an “editor” may have the permissions to publish a finished article. Another user could only be allowed to moderate the look and feel of the site, etc.